ARMED police swooped on a residential street to arrest a boy with a spud gun. Police were called to Winston Crescent, Biggleswade, to a report of a youngster carrying a firearm. (note that address: "Winston Cresent, Biggleswade". 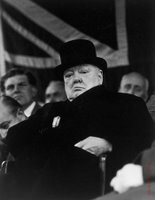 Imagine being asked your address and being able to answer, "Winston Cresent, Biggleswade." That is just so cool. The force helicopter was scrambled, an armed unit was sent out, and the road closed off. But when officers visited the 15-year-old's house, it turned out the only weapons in his possession were a potato gun and a BB gun. He was cautioned following the incident on Wednesday night. A spokesman for Bedfordshire police said: "The firearm turned out to be a spud gun, but the person who called the police did exactly the right thing. If you have any sort of gun at all, don't carry it in public." My friend Mikey Sklar has recently started a blog on the topic of fire art. "It had bothered me to no end that there was no single place to easily learn about some of the amazing fire installations that had been designed in the last decade." Mikey's blog is the best place to visit to understand some of the things the artists who specialize in this genre are doing. 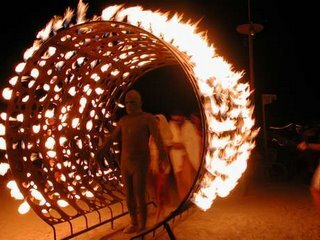 I saw a lot of fire art at Burning Man and there are other hot spots (no pun intended) as well; for instance the Crucible in San Francisco and the Fire Arts Center in Chicago. Notice the posts at this blog have been kinda slim lately? The weather is getting nicer and nicer and I'd like to spend more time out of doors. But, I'm getting busier and busier with writing and speaking assignments. (Highlight: I'm giving a series of talks, including several aboard the SS Queen Mary 2 as it steams from New York to London in July.) Not complaining a bit, but something's got to give and I'm afraid it's going to be tougher to find time to update this blog regularly. Which is a shame, because I really enjoy blogging on what 's going on out there with Underground Technology. For example, the Navy has just sunk the WWII carrier USS Oriskany by using precise demolition charges to let it settle into the Gulf of Mexico. There are a number of great technology events coming up this summer I'd like to write about. For instance, this weekend I'm a judge at the Mechwars IX robotic combat event. Then on Wednesday, I leave to cover the the Humboldt (CA) Kinetic Sculpture Race for a magazine (Make) where I've recently been offered a position as contributing editor. In June there's the York (PA) Factory Tour weekend, more airshows than you can shake an F-16 at, and many great pyro events. But, going forward, there's just not enough time to cover them here. So, for now, check out the Make Magazine blog and Boing Boing for always good, always current info, and please check back here from time to time to see what's new. I'll post when I can; and I hope to resume daily posts after the summer. Summer approaches and that means it's hurling season in the UK. Last year I saw Peter Vemming Hansen's trebuchet at Denmark's Middelaldercentret and yes, it's big. 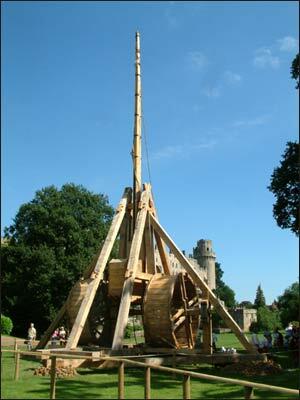 Now, I see that another big catapult, named "Ursa" is starting up at England's Warwick castle. A man with muscles of iron and nerves of steel has been chosen to help tame one of the world's most fearsome females. She wreaked death and destruction on those unfortunate enough to stand in her way for more than 200 years, and now brave Andy Tomlin has been charged with controlling her fiery temper. The 21-year-old former fitness instructor is the new master-in-charge of Ursa - the world's largest catapult - at Warwick Castle. Ursa's vital statistics are impressive - she stands 60ft tall, weighs 22 tonnes and is powerful enough to fling 300 lb of rocks and other nasties 330 yards. The awesome power of the siege engine, or trebuchet, is demonstrated during the castle's summer season, which begins this weekend. So, want to build your own siege engine? Check out my building-a-catapult.com site for ideas and catapult information. Here's a picture of the catapult I built a couple of years ago. I call it Ludgar the Warwolf after the trebuchet built by the English in 1304 to take Scotland's Stirling Castle. It was great to see the pictures of those Tasmainian miners walk out of the mine. The diagram comes from the BBC and shows how the rescue team bored a hole underneath the space the miners were in. According to some reports the rock was so hard it couldn't be drilled. So, instead, the rescuers used a technique called PCF or pentrating cone fracture. It's a lot like a highly controlled, highly directional explosion. The Pentrating Cone Fracture technique uses a cartridge that consists of a hollow plastic tube that holds propellant. It is initially open at one end allowing the tube to be filled with propellant. The open end is then closed with a small cap. The other end of the tube is machined into a wedge to lock into the stemming and seal the hole when the cartridge is initiated. When ignited, the PCF charge fractures rock or concrete by the introduction of a pulse of high pressure gas at the base of a drill-hole. The generated gas penetrates into small microfractures and fissures in the rock. These microfractures and fissures are forced to expand and propagate into tensile cracks causing the rock to fail. A cartridge filled with a specially formulated propellant produces gas by deflagrating when the propellant is ignited. Because the gas is confined down the hole in a very small volume, very high gas pressure is generated when the propellant is ignited. Here's an Australian beer ad that is well worth watching. The highlight is the great catapult (it's a trebuchet actually) action and the way the hurling synchs up with the march from the Great Escape. Very well done. Anyway, this would appeal to Big Jim and Billy Sol, I'm sure. CAVENDISH, Idaho – Because shooting at paper targets can get boring, there is Boomershoot, where the targets blow up. The weekend-long event is held each spring in a remote Idaho farm field and is considered a "Magic Kingdom" for serious long-distance shooters, said organizer Joe Huffman. Participants pay $100 for a slot on the firing line, from which they plink at hundreds of high-explosive targets, some not much bigger than a brick and barely visible to the naked eye from 2,100 feet. Even from that distance, the targets can produce a chest-thumping shock wave. And, even better, there's ANVIL FIRING at halftime! Steve Joachim, a welder from Tum Tum, Wash., blasted an 80-pound anvil high into the sky for halftime entertainment Sunday. As the shooters watched during their lunch cease-fire, a steel tube was packed with black powder, then covered by the anvil. Before the fuse was lighted, Huffman offered a critical piece of advice: "If it starts coming down on top of you, move." The anvil blew 75 feet high, prompting shouts of "Make it go higher!" and "More powder!" and "You might be a redneck if…"
Joachim poured an even larger charge for the second attempt. It would be the biggest blast ever, he said, even bigger than last anvil launching on Easter. This time the anvil soared for nearly 6 seconds. <--- After launch aboard a Lockheed-Martin Atlas V rocket, the New Horizons spacecraft set out on a journey to the edge of the solar system. 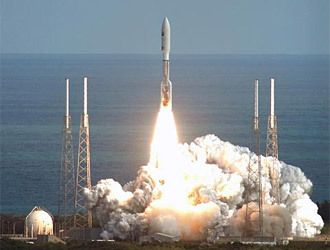 Liftoff occurred Jan. 19, 2006 at 2:00:00 p.m. EST from Launch Complex 41 at Cape Canaveral Air Force Station in Florida. 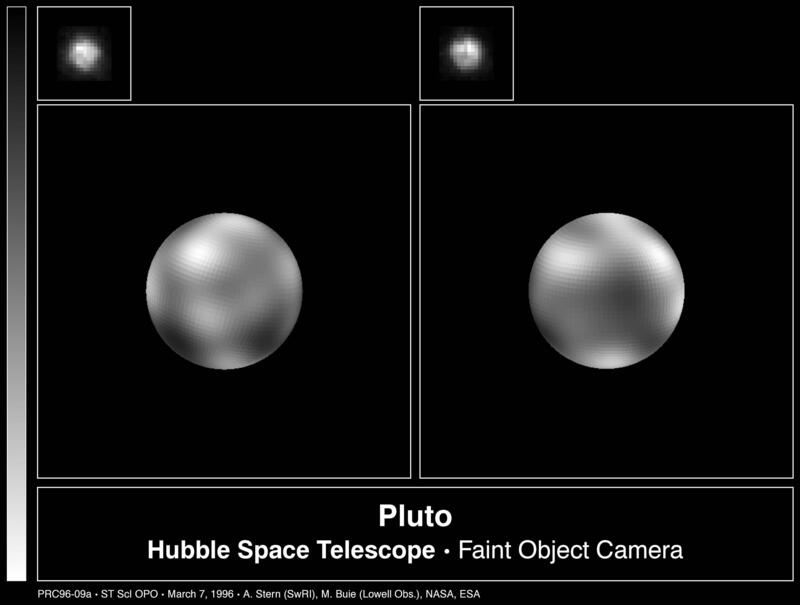 New Horizons is headed for a distant rendezvous with the mysterious planet Pluto almost a decade from now. Many years ago, I built a six inch reflecting telescope with my father. We ground the mirror, collimated the parts, built the mount and so forth. It was quite a satisfying experience to see the rings of Saturn and moons of Jupiter, and especially the craters on the moon. It seems to me there's been a couple of recent news stories about finding new planets. Still, as far as I know, pluto is the last planet. I think it's interesting that everybody I've ever met knows about the planet Pluto. It's a completely unimportant thing. How come a small rock in extreme elliptical orbit discovered in 1930 is known to 99% of the population? I think it's because people were interested more in science and discovery in the past than they are today. Given the general apathy shown by people towards science today, if someone discovered another rock 3 billion miles away today, would it make it into textbooks or even newspapers? Along those lines, National Astronomy Day 2006, held this year Saturday, May 6, gives astronomy-lovers a chance to share their passion with the astronomy-curious. Clubs, planetaria, observatories, and museums will host public viewing events, telescope workshops, hands-on activities, and presentations to increase awareness about the profession and hobby. Here is a link to local events. One of the most popular and best attended lectures I've gone to recently involved a paper airplane folding demonstration. Hundreds of people showed up to learn the paper folding techniques requisite to crafting high performance airborne origami. As soon as ground control at Hangar-7 in Salzburg has cleared the airspace, paper airplanes will take the law of logic to its limits. Preconditions: one DIN A4 format sheet of paper, no scissors, no glue! The most creative junior engineers from 48 countries live out their dream of flying in the most simple way and long for their sense of flying without any turbulence or match to determine the most creative style of flying. Catagories include longest distance thrown, longest time in the air, and most acrobatic. I'd like to see a category for folded airplanes made out of something besides paper or cardboard. How about a sheet metal glider? Or starched cloth?